Home » » Why Do Our Lawyers Still Wear White Man Wigs? Why Do Our Lawyers Still Wear White Man Wigs? 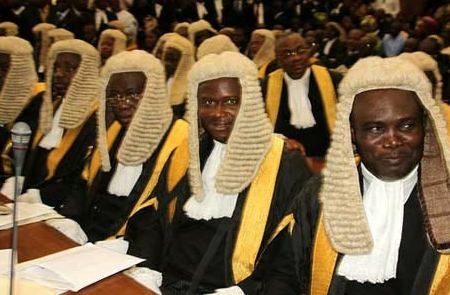 Nearly 60 years after independence from colonial rule, why do our lawyers still wear these things on their heads? Is it that we cannot devise a home-grown attire for our lawyers, or is it that we so love the colonial rulers and exploiters of our land, that we just cannot let go of their legacy? Did somebody do juju on us to turn us into mumus where the colonialists are concerned? India, Pakistan, and parts of China were colonized by the British. But their legal systems have jettisoned those colonial wigs ages ago. In Africa, Nigeria, Kenya, and other ex-colonies, still continue to wear them. What is wrong with us as a people? Seriously, we need to approach our ancestors for forgiveness, in case we did something to them that made them place a curse on us, that has turned us into dumb mumus without basic common sense and dignity, especially where it concerns Europeans. Imagine for a second how the white people will be laughing their heads off when they see us wearing these things, a full sixty years after independence.